This salad is inspired by a dish served at The Wine Gallery in Corona del Mar. The Wine Gallery is one of our favorite places to walk to, try a new wine or two and snack on their offering of small plates. 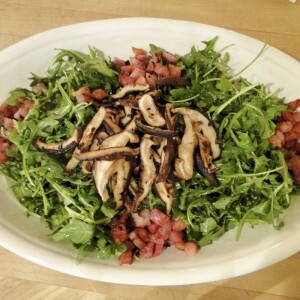 The mushrooms, pancetta and parmigiano reggiano make this salad umami-rich and satisfying. Almost a meal in itself. Have your deli or butcher cut your pancetta in 1/2" slices, so you get chunks of pancetta instead of thin slices. To preserve their nutritional value take care not to sauté the shiitake mushrooms for more than 7 minutes. See my post on Jerez Spanish sherry vinegar. Add a little grilled chicken if you want to make this salad a meal in itself. Mushrooms, pancetta and parmigiano reggiano make this salad umami-rich and satisfying. Almost a meal in itself. Cook the pancetta chunks in a medium hot pan until they begin to crisp. Remove from pan and drain on a paper-towel lined plate. Set aside. Saute the mushrooms with 1 T of the shallots in the rendered fat from the pancetta until mushrooms are browned and soft. About 5 minutes. While the mushrooms are sautéing, combine 1 T shallots and vinegar together in a small bowl. Gradually whisk in olive oil to create an emulsion. Season with salt and pepper to taste. Toss arugula with dressing and mound it in the middle of a serving platter. Add the arugula with the mushrooms and pancetta to the platter and top with parmigiano reggiano shavings.